From the previous post, I had posted a modified Proton Saga convertible. 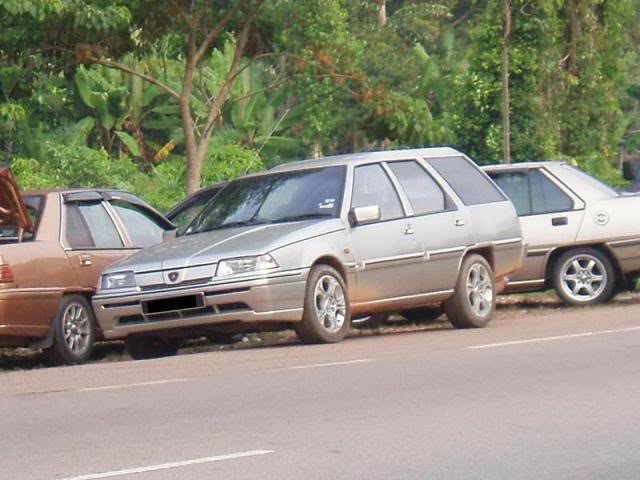 And now I would like to post up another unique modification based on a Proton Saga Iswara whereby the owner of the car had converted it to a station wagon.Or a Mitsubishi Fiore station wagon converted with a front Proton Iswara. What is station wagon? For those who not familiar with it, here is the definition of station wagon. A station wagon is a body style variant of a sedan/saloon with its roof extended rearward over a shared passenger/cargo volume with access at the back via a third or fifth door, instead of a trunk lid. The body style transforms a standard three-box design into a two-box design—to include an A, B and C-pillar, as well as a D pillar. Station wagons feature flexibility to allow configurations that either favor passenger or cargo volume, e.g., fold-down rear seats.